Narendra Modi took oath as India's 15th Prime Minister. 7.35 pm: Uma Bharti says she gets Water Resources and Ministry for Ganga cleaning. 7.25 pm: Sudarshan Bhagat and Vishnudev Sahai take oath as Minister of State. 7.23 pm: Raosaheb DP Danve, Pon Radhakrishnan, Kiren Rijiju, Krishan Pal, Sanjeev Kumar Baliyan take oath as Minister of State. 7.20 pm: Key player in BJP’s Haryana initiative Krishan Pal Gujjar take oath as Minister of State. Congratulations @narendramodi and team BJP, NDA. All the best, in your new role for India. 7.15 pm: Krishan Pal, Kiren Rijiju take oath as Minister of State. 7.10 pm: Nirmala Sitharaman takes oath as Minister of State (Independent Charge). 7.08 pm: G M Siddeshwara, Manoj Sinha, Nihal Chand, Upendra Kushwaha take oath as Ministers of State. 7.05 pm: Jitendra Singh and Piyush Goyal take oath as Minister of State. 7.00 pm: Prakash Javadekar, Dharmendra Pradhan, Shripad Naik take oath as Cabinet ministers. 6.55 pm: Rao Inderjit Singh, Sarbananda Sonowal and Santosh Gangwar take oath as Union Cabinet Ministers. 6.51 pm: Dr Harsh Vardhan and Gen VK Singh take oath as Union Ministers. 6. 49 pm: Smriti Irani takes oath as Cabinet Minister, she is the youngest minister in Modi’s Cabinet. 6.44 pm: MP from Gwalior Narendra Singh Tomar, Radhamohan Singh and Jual Oram take oath as Cabinet Ministers. 6.40 pm: Shiv Sena leader Anant Geete and SAD MP from Bhathinda Harsimrat Kaur take oath as Union Cabinet Ministers. 6.37 pm: Chief National spokesperson of BJP Ravi Shankar Prasad, Anath Kumar and TDP’s Gajapati Raju take oath as Cabinet Ministers. 6.34 pm: Dr Najma Heptulla, Gopinath Munde, Ram Vilas Paswan, Kalraj Mishra and Maneka Gandhi take oath as Cabinet Ministers. 6. 24 pm: Former Madhya Pradesh CM and Lok Sabha MP from Jhansi in UP, Uma Bharti takes oath as Cabinet Minister. 6.21 pm: Nitin Gadkari and Sadananda Gowda take oath as Cabinet Ministers. 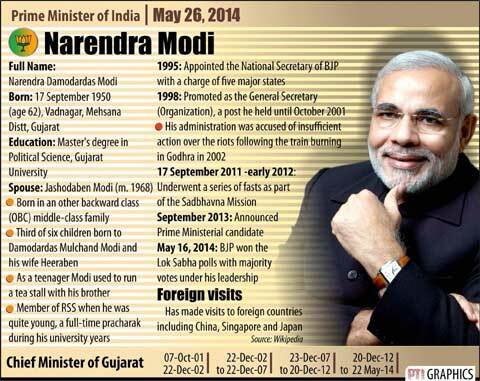 Congratulations @narendramodi ji. You are now Prime Minister of all Indians. We honour&respect your office &wish you well, till we disagree. 6.18 pm: Arun Jatiley, Venkaiah Nadu take oath as Cabinet ministers. The World’s Largest Democracy has a new Leader – Heartiest Congratulations to our new Prime Minister Shri @narendramodi ji! 6.13 pm: Rajnath Singh takes oath as the Cabinet minister. 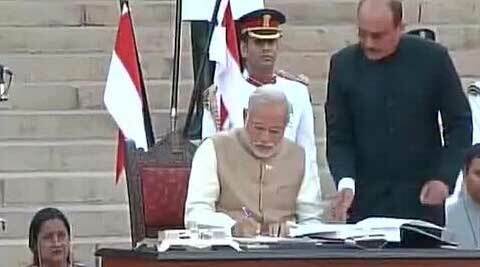 Congratulations to @narendramodi as he takes the oath as 15th PM of our nation. His team looks impressive & wishing them all the success. 6.10 pm: Narendra Modi takes oath as India’s 15th Prime Minister. 6.08 pm: President Pranab Mukherjee arrives at the Rashtrapati Bhawan. 5.58 pm: Prime Minister-designate Narendra Modi arrives at Rashtrapati Bhawan for the swearing-in. 5.45 pm: Pakistan Prime Minister Nawaz Sharif arrives at the Rashtrapati Bhawan for Modi’s swearing-in ceremony. 5.35 pm: Bollywood makes it presence felt at Rashtrapati Bhawan as Hema Malini, Dharmendra, Shatrughan Sinha and Anupam Kher attend Modi’s swearing-in ceremony. What fun to sit here & watch the new power dynamic unfold. 5.12 pm: BJP leader Murli Manohar Joshi arrives at Rashtrapati Bhawan forecourt to attend PM-designate Narendra Modi’s swearing-in ceremony. 5.00 pm: Pakistan Prime Minister Nawaz Sharif leaves for Rashtrapti Bhawan for Modi’s swearing-in ceremony. 3.00 pm: Maldives President Abdulla Yameen arrives in New Delhi to attend Narendra Modi’s swearing-in ceremony. 2.50 pm: Salman Khan arrives in Delhi to attend Modi’s swearing-in ceremony. 2.40 pm: Former Bihar Chief Minister Nitish Kumar has extended his greetings to the government led by his bete-noire Narendra Modi who will take charge this evening. 2:10 pm: Lata Mangeshkar and Amitabh Bachchan may give Narendra Modi’s swearing-in ceremony a miss in Delhi today while a host of Bollywood celebrities like Anupam Kher and Vivek Oberoi will attend the function. 2:04 pm: Total of 23 cabinet ministers, 10 Independent and 11 MoS will be appointed. 2:03 pm: Nripendra Misra to be principal secretary to the PM. 2:00 pm: Piyush Goel to head Oil and Energy ministry. 2:00 pm: Rajnath Singh gets home ministry portfolio. 11:40 am: Modi to have 10 ministers with Independent charge. 11:25 pm: Afghan President arrives in New Delhi. 11:12 am: Nawaz Sharif says carrying a message of peace from Pakistan. 10:50 am: Pakistan Prime Minister Nawaz Sharif leaves for India to attend Narendra Modi’s swearing-in ceremony. 10:44 am: NDTV reports that Modi’s cabinet will have 23 senior ministers and 10 Ministers of State. 10:30 am: Mauritius Prime Minister Navin Ramgoolam arrived to attend the swearing-in ceremony of Narendra Modi. 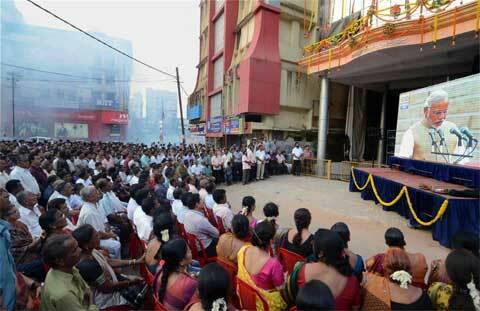 10:20 am: Rajinikanth not to attend Modi swearing-in ceremony. 10:15 am: Ministerial probables have tea with Modi. 10:14 am: Uma Bharti,Maneka, Venkaiah Naidu to get cabinet berths. 10:11 am: LJP’s Chirag Paswan to be a part of the cabinet. 9:55 am: Rajapaksa arrives for Modi swearing in ceremony. 9:45 am: Cabinet list has been sent to Rashtrapati Bhavan. 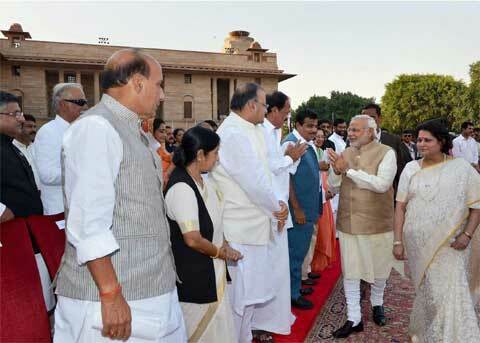 9:37 am: PM designate Narendra Modi visits Rajghat ahead of swearing in ceremony. 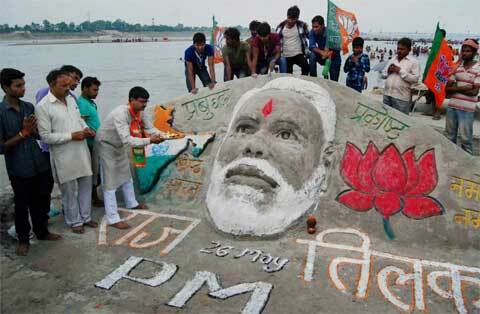 PHOTO GALLERY: Narendra Modi in Rajghat. 9:35 am: Nirmala Sitharaman, VK Singh get calls from Narendra Modi. 9:20 am: Pakistan frees Indian fishermen, Sri Lanka set to follow suit. READ MORE: Pakistan released 59 Indian fishermen from Malir jail in Karachi and 92 from Nara jail in Hyderabad in Sindh province. 9:00 am: IAF has put in place an air defence system to secure the skies. Anti-aircraft guns have been placed at classified locations. 8:30 am: While the Rashtrapati Bhawan guest wing will be thrown open for foreign delegations ahead of the banquet, none will spend the night there. READ MORE: Sri Lankan President Mahinda Rajapaksa is coming with son Namal, who is seen as his heir apparent. On my way to Atal ji’s residence to seek his blessings.